Many moons ago I fell in love with Bavarian crochet and I hankered after making a blanket using my new skill. I bought some glorious yarn – Titus from Baa Ram Ewe in the wonderfully named colours Eccup, Bramley Baths and Filey* – and I set about it. It looks beautiful, and once the pattern is set it’s quite easy… and therein lies the problem. After a while I started to get bored. That combined with the fact that it doesn’t grow very quickly, so progress is slow, led to me setting it aside in favour of more exciting projects. As a result, it has been in a bag, untouched, for nearly three years (hangs head in shame). However, towards the end of last year Wild Daffodil posted about a blanket that she had just completed for her grandson and I noticed that it included some squares with a Bavarian crochet centre and a plainer border using a pattern called Bavarian Beauty. I didn’t rush into anything, but the seeds had been sown and I knew I could finish my blanket without it driving me to distraction. Anyway, tomorrow I’ve got another day at Red Apple Yarn, and since the weather has returned to being cold, I thought it might be nice to work on (and under) a blanket in the shop. So, yesterday I printed off the pattern for the square and this afternoon I have familiarised myself with Bavarian crochet once more and done a bit of work on the old project. I left it part way through a round, so that needs to be finished off before I can progress with the change of pattern. By the end of the year I am hoping that all projects that were in progress in January, however old, will be completed or frogged. So far it’s going well… think of it as a very slow declutter! * Well, wonderfully named for me since I grew up very near Eccup Reservoir, had day trips out to Filey and went to, well, Meanwood Baths rather than Bramley Baths, but still the names and places were all part of my childhood. Next week, I’m hoping to show you her done (although probably not blocked) and to give you my thoughts on the project… both my personal feelings and some thoughts/advice to anyone considering making their own Sophie. Because Sophie has consumed most of my creative time for the past six weeks, I now have a whole bunch of things that I want to make, but haven’t managed to get on with. So, in the coming months, look out for slippers, more wellie socks for Mr Snail, Norwegian socks, a neck-down jumper in the round, a warm snuggly jumper, a tea cosy, sea slugs and a cardigan. Well, that’s my progress this week and plans for the future. What have you been up to? Have you got anything you are itching to make a start on? This is my weekly post as I work through the yarn in my “collection” (not stash – thank you Sue). This week there has been a little sock knitting; mostly undertaken in waiting rooms – dentist and optician. There’s also been another breast prosthesis – this combines knitting and crochet and I’ve used some organic cotton yarn that was given to me, I think, by ItwasJudith (thank you G.) over at Wee Story Book. But mainly it’s been Sophie. She’s getting bigger and there’s now a row of flowers with leaves, plus the big flowers are nearly done on the “short sides” (which will soon be longer than the “long sides”, but that’s the terminology used in the pattern). I have not yet completed half of the rounds, so there’s load more work to do yet. And finally, please do take a moment to leave a comment on my 1001 post before the end of Friday (1 December 2017) so you can be entered into my give-away draw… no specific prize, it will be something tailored to you personally if I know you (come on regular posters, don’t be shy) or something that I think will make you smile if I don’t really know you (new readers also don’t be shy – random acts of kindness are especially rewarding when you don’t know the recipient). I have also started to put a bit of my stash into the secret Santa basket… I’m not going to photograph it, because I want it to be a surprise for the recipient. I can say, though, that it’s pure British wool. So, that’s my progress this week. Have you completed any projects? Are you working on anything interesting? This is my weekly post as I work through the yarn in my “collection” (not stash – thank you Sue). In fact this week it mostly isn’t ‘stash’ because nearly all the wool that I worked with was bought relatively recently and for specific projects. Nevertheless, it’s nice to see wool from my store (however long it’s been there) becoming “things”. I also make a quick pair of fingerless mittens (mentioned in last week’s Three Things Thursday), which I still haven’t delivered to the intended recipient. I shared much of the work on “Sophie” on Sunday, but I have done more since then, when she was a circle. The corner flowers turned out to be rather complicated, with the work layered so that sometimes you work in front of previous stitches and sometimes behind. As a result, progress has been quite slow. The back (first and third pictures) is quite tidy, but gives an idea of the complexity. It’s entirely possible that the whole month of November is going to be about Sophie, but I do have another knitted breast prosthesis to make and a pair of socks to finish, so there may be a little variety. So, that’s my progress this week… and there was no blue in it! Have you completed any projects? Are you working on anything interesting? 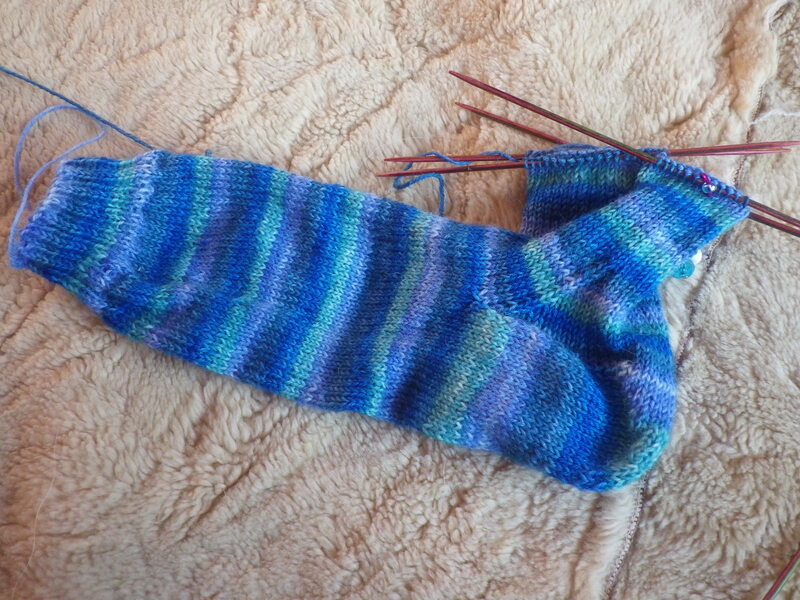 I have completed one of Mr Snail’s wellie socks and the other one is progressing very nicely. In the end I had to order the yarn from the manufacturers and it looks like I bought a ball too many (even though I got the amount suggested on the pattern). I might, therefore, make a matching hat and/or fingerless mittens to go with the socks. The stripy sock (for me) I was working on last week has also grown, and I have turned the heel. This is the first of the pair. Once both these pairs are done I will have completed my target of making six pairs of socks this year… although I’m very likely to make one more before we reach 2018 as I’d like another thick pair of socks for myself and I want to have another a go at a Norwegian design with the remaining Norwegian wool in my collection (I made a pair a while back). This is my weekly post as I work through the yarn in my “collection” (not stash – thank you Sue). Now I have to confess that there is a project this week that is going to require a yarn purchase as I simply do not have enough of a suitable yarn to complete it, although I started it with yarn I already had, so there should certainly be no net gain. I finished a few things this week: the turtle, some fingerless mittens and a breast prosthesis for a lady who has had a mastectomy. I’m also delighted to report that the snailvaark I made and couldn’t photograph last week reached his destination safely and is much loved. I’ve been working on two pairs of socks as well this week and it’s the red ones that will require more yarn. They are for Mr Snail to wear inside his wellies and so they need long legs and thus lots of wool. I’m slightly disappointed that I’m going to buy yarn before the end of the year but I am consoling myself that it is for a very specific project and, hopefully, I will be able to buy it locally (I’ll find out a Knit Night on Thursday whether Jude has any more – the original ball came from her shop). Both of this week’s projects used yarn that I already owned, so the collection is very slowly getting smaller. 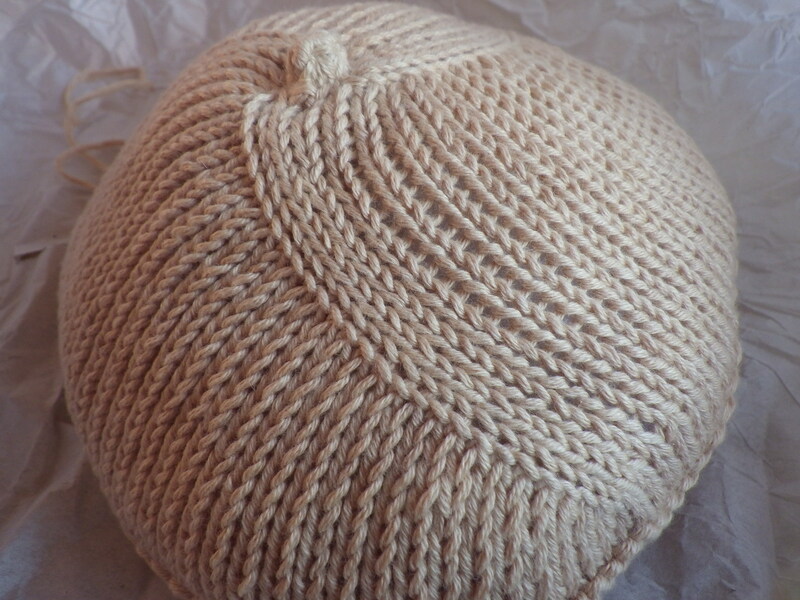 The turtle is worked in Cambrian Mountains Wool and is beautifully soft – I plan to fill it with 100% wool stuffing so that it will be made entirely from natural fibres. Golden spikes jumper: completed. But the unseasonably warm weather means it’s too warm to wear it yet! I’m a little unsure about the rather tight sleeves, but until it has been worn for a while, I won’t know whether I need to make some adjustments (i.e. knit new, wider sleeves). The 4-ply Skeleton hat: completed. Pattern needs to be typed up. Honeycomb cables socks: completed (and on my feet). An interesting project, but not one I will be repeating. A snailvaark is underway. This is a gift that I have been intending to make for a few weeks. I’ve done the knitting for the shell, but it needs grafting. The body is not yet started. I’ve been asked to make a turtle, but apart from finding a suitable pattern, I haven’t actually started on it yet. Next week: a different colour? So that’s my progress this week. Have you completed any projects? Are you working on anything interesting?